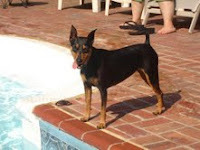 Hearts to the Rescue: UPDATE: IN FOSTER CARE BUT STILL NEED A PERMANENT HOME. UPDATE: IN FOSTER CARE BUT STILL NEED A PERMANENT HOME. I just have no idea what to do. 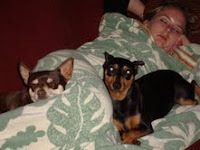 They are such well behaved dogs, crate trained for work and overnight hours, housetrained and so loving. Both are fixed, UTD on shots, and monthly medications for heartworm and fleas. All you have to do is say the word "cage" or even when you get your car keys and put your shoes on, and they run into their cage together. I give them a small baby carrot as a treat each time they get in their cage because the chi is too overweight to get regular treats really. You also might find them sleeping in their cage during the day or if we have parties and they do not feel like being around other people. It is their safe place. My chihuahua has a sensitive personality and I think needs to stay with the min pin. She is easy going and loves anyone or any dog, so the min pin should fit anyone. 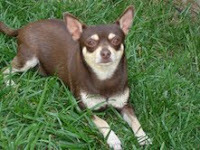 The chi, however, I believe will take a little bit of time to warm up to a new family and does not like ANY other dogs. He doesn't bite or isn’t yappy like the little tiny ones, but will let off a little growl if a new dog gets too close to him and he'll walk away. He just gets very upset if we ever had dog guests at the house. Luckily for him, since we realized my son's allergies, I have not allowed family to bring over any of their dogs for visits or babysitting...so he's been happy about that. I know I can NOT keep them....I've tried everything with the allergies. Separation, better grooming, and many doctor appointments for my son at specialists.....nothing helps. I've had them trained since I got each of them around 8 weeks of age. I would love for them to go together, that is my main goal. I never thought in a million years I'd be forced to make a decision like this, but I am. Any help is appreciated so much! Monica Behrooz CONTACT: roxygizmo@comcast.net Return soon for updated contact info.